"You can search throughout the entire universe for someone who is more deserving of your life and affection than yourself, and that person is not to be found anywhere. You yourself, as much as anyone in the entire universe deserve your love and affection." -Buddha If you've followed my blog for a while, you know I am a huge advocate for trying to go beyond the diet mindset. I encourage sustainable changes that improve your health and well-being rather than trying to lose weight. Your mental and emotional health is an important part of your overall health, and there's no point driving yourself crazy and being stressed out about your diet and weight. That's why I was thrilled when I had the chance to read the new book - Wellness, not Weight by Ellen Glovsky, PhD, RD, LDN. I had the opportunity to take a Motivational Interviewing workshop with Ellen last year, which is the approach I take when counseling patients or clients. It's client-centered rather than the dietitian telling someone what they should eat or do. Wellness, not Weight looks at the research behind dieting and if it actually works or not. The truth is it doesn't, and there's no guarantee that losing weight will make you healthier. In fact, dieting has been shown to be a strong predictor of future weight GAIN. Every year (right around New Year's usually), people attempt to lose weight. More often than not, they may lose weight initially, only to gain it all back (and more). In the Framingham Heart Study, this weight cycling is associated with an increased mortality rate and increase in heart disease mortality. Unfortunately, for people who are classified as overweight or obese by BMI standards, most people, including doctors and dietitians, believe that losing weight is the key to improving health. They often tell patients to eat less and move more and may encourage counting and cutting their calorie intake. Professionals and the public participate in weight discrimination, intentionally or unknowingly. Some (not all!) health professionals blame people for their weight and think of them as lazy or without willpower (hello, not true!). They spend less time and effort with them, may show negative behavior to them, and subject healthy but overweight patients to more unnecessary tests. They encourage unhealthy ways to lose weight, such as excessive exercise and calorie restriction (1200 calories is not healthy for anyone!). There is a definite risk for disordered eating habits to develop or worsen with yo-yo dieting or encouraging these dieting methods. If you are a health professional - dietitian, personal trainer, physician, health coach, etc. - I highly recommend this book. You may be unintentionally discriminating your clients based on their weight, and this book will help you take a weight neutral approach, as well as switch from a weight to health focus. You can buy the book here. Letting go of the idea you have to eat perfectly. Truth: No one has a "perfect" diet! Find role models that encourage a non-diet approach. 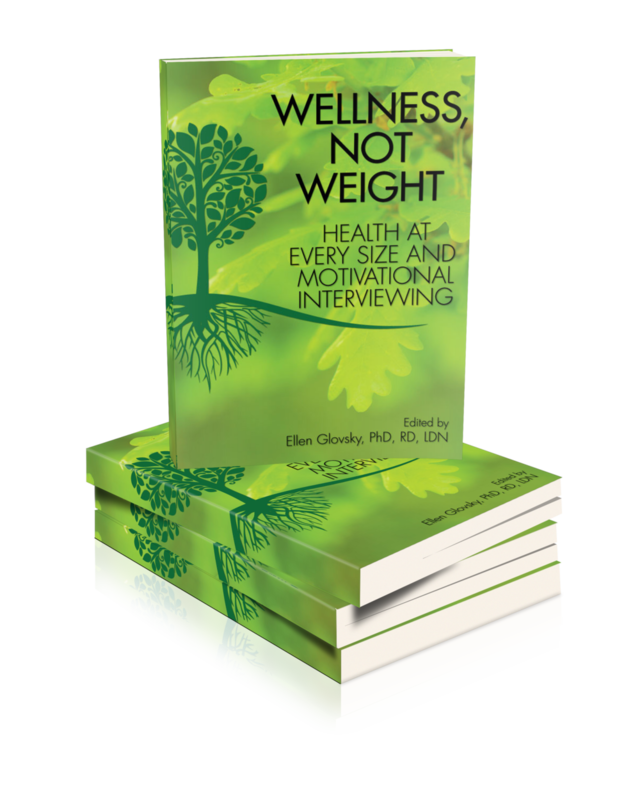 Some of my favorites include Marci Anderson, Marsha Hudnall, and all the authors who contributed to Wellness, not Weight! Pay attention to your feelings & emotions. Stop and actually feel them! Listen to what your body is saying. Don't spend money or time on books, blogs, or health professionals that focus on weight loss! There's always going to be new diet books coming out, but I encourage you to skip them. Instead, spend time thinking about simple goals that encourage wellness, or meet with a dietitian who takes a no-dieting approach. Move your body anyway you like. Short bouts of movement during the day count. Make it fun, not torture! When improving health, mindset is often ignored. You may know you "should" eat vegetables, drink more water, or exercise, but it's only when you address your mindset that you may start making these changes. You need to give yourself lots of self-care and love. Take time to set sustainable health goals and intentions. Listen to what your body is telling you, and feel your feelings. Switch your perspective from black and white thinking like sugar is "bad" and kale is "good," and think of the foods that make you feel good. As you are moving away from diets, you may choose to find a role model that takes a no-dieting approach. You could read their blog, work with a dietitian or therapist, or find a friend as an accountability partner. It's possible to free yourself from diets, and you're totally worth doing it! You can learn more about the book here or on the Facebook page as well. Disclaimer: I received a digital copy of this book for free to review it. All my thoughts are my own.